NOTE 4/24/09: This site is undergoing updates - the reviews should be working and will be updated regularly. Some of the older pages are not working and will be fixed shortly. Thank you! 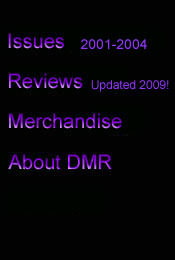 This site is dedicated to those who worked to make DMR what it was - you know who you are! Dark Moon Rising is a publication of Gryphon Moon Publishing, 1999-2009©. All Rights Reserved.